What hose should I use for my central vacuum? 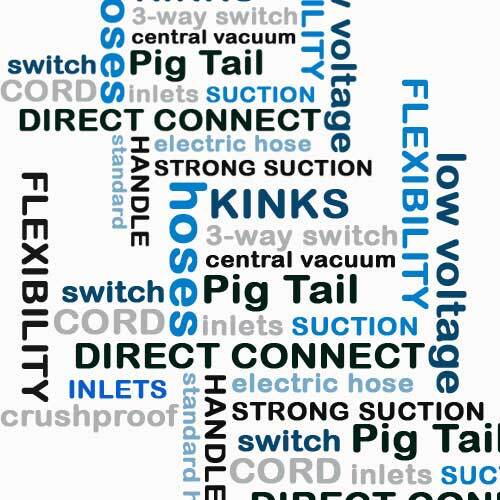 Are you in the market for a new hose for your central vacuum system? If so, you are aware of the number of hose types on the market. A central vacuum hose can weight anywhere between 6 and 10lbs. and may vary from 30 to 50 feet. They are made of crushproof material which provides excellent flexibility, performance and prevents kinks yet maintains a strong suction. 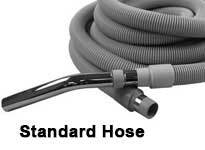 Standard hose: Has a continuous metal band on the inlet end and no switch on hose handle. To get suction simply insert the hose into inlet. The suction will not turn off unless you pull the hose out of inlet. Electric powerheads cannot be used with this hose. 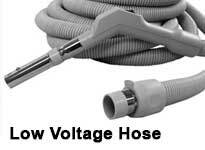 Low voltage hose: Has a split metal band on the inlet end and on/off switch on hose handle for suction. This hose cannot power an electric power brush. 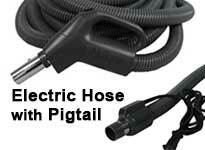 Electric hose with pigtail: Has an 8-foot electric cord extending from the inlet end and 3-way switch on hose handle. This hose is used with an electric powerhead. 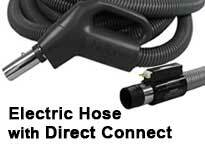 Electric hose with direct connect: Has 2 prongs on the inlet end that plug into a 120-volt receptacle on the inlet. The hose handle has a 3-way switch. This hose is used with an electric powerhead. All products are available on our website and in store. Our showroom is open M-F 8am-5:30pm and Saturday 10am-3pm. Don’t forget to visit our Facebook page for upcoming sales and tips.